The Japan International Research Center for Agricultural Sciences (JIRCAS) has commenced this year's search for recipients of the annual "Japan International Award for Young Agricultural Researchers." The purpose of the program is to increase motivation among young researchers contributing　to research and development (R&D) in agriculture, forestry, fisheries and related industries in developing countries, which is being promoted by Japan for the benefit of these countries. The nomination/application deadline is on June 13, 2014 (Friday). The Biosciences eastern and central Africa – International Livestock Research Institute (BecA-ILRI) Hub and the Bill & Melinda Gates Foundation (BMGF) are pleased to announce the Agricultural Research Connections (ARC) Workshops to be held in June, 2014 in Nairobi, Kenya. These unique workshops will bring together scientists based within and outside of sub-Saharan Africa to foster scientific collaborations with the potential to create new pathways out of poverty for African farming families by addressing issues related to the crops on which they depend. In addition to learning about agriculture in Kenya, participating scientists will be given the opportunity to describe their own areas of expertise and explore with other workshop participants possible collaborations that could contribute to the advancement of agriculture in sub-Saharan Africa. 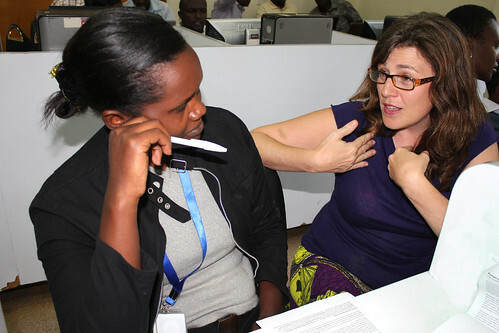 The goal of these workshops is to catalyze new research partnerships among high-caliber scientists who could then compete for funding through calls for proposals including the upcoming Program for Emerging Agricultural Research Leaders (PEARL), with projects led by scientists in African national programs. More information on this program is now available on the www.gatesfoundation.org website under 'Current Grant Opportunities'. ARC Workshop participants will tour regional laboratories and facilities, visit local farmers, and engage in discussion sessions in Nairobi and the surrounding area. Sessions will include presentations on agricultural challenges in Africa. Participants are expected to play an active role in seeking and developing new research partnerships, including developing proposal outline ideas for future competitive funding opportunities. If you are interested in participating, please complete the online application by April 18th, 2014. The Bill & Melinda Gates Foundation seeks proposals for agricultural research with the potential to increase the sustainable productivity of smallholder farmers in developing countries. Sustainable productivity includes tackling the underlying social and economic determinants of productivity, such as gender equity, environmental issues, and healthy, diverse diets. With this call, we are looking for projects led by MSc and PhD scientists at national agricultural research institutions and universities in sub-Saharan Africa, working in collaboration with other researchers internationally (either within Africa or beyond the continent). More information is available at: http://www.gatesfoundation.org/How-We-Work/General-Information/Grant-Opportunities/Program-for-Emerging-Agricultural-Research-Leaders-2014. ** While previous ARC workshops were open to researchers in the livestock-related sciences, please note that the 2014 workshops are focused only on crop & soil sciences. We intend to offer future opportunities specific to livestock research - please email PEARLs at gatesfoundation dot org if you would like to be added to our contact list for future updates. On Thursday 27 March, 2014 His Excellency Fulgence Ndayishimiye, Ambassador of the Republic of Burundi in Kenya and Mr Jean Baptiste Ciza, Second Counsellor, Embassy of the Republic of Burundi in Kenya visited the BecA-ILRI Hub. The ambassador’s visit to the BecA-ILRI Hub was inspired by his meeting with three research fellows from Burundi who are conducting their research at the Hub. The three visiting scientists’ research on different crops and livestock is significant to the achievement of improved livelihoods in their country through increased food and nutritional security and income. Gedeon Nsabiyumva, a researcher at the Burundi Agronomic Sciences Institute (ISABU) is conducting research that addresses toxic postharvest maize contamination in Burundi; Vincent Nteziryayo, an assistant researcher at the University of Burundi is working on the characterization and domestication of nutritious saprophytic wild edible mushrooms that grow in different forests of Burundi; and Constantin Nimbona, a research scientist ISABU is conducting studies that address the issue of cattle tick borne diseases in Burundi. During the visit, HE Ndayishimiye reiterated the importance of the work being done by the Burundian researchers at the BecA-ILRI Hub citing that agriculture is a national priority for Burundi, providing employment for more than 90% of the population. The ambassador acknowledged the challenges facing this important economic activity and lauded the BecA-ILRI Hub for helping address some of the issues. 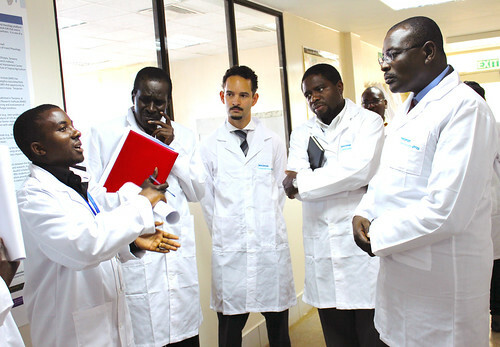 As part of the visit, the Ambassador and the Second Counsellor toured the laboratory facilities where they learnt more about the technologies available for use by researchers from Burundi and other countries in Africa. Research by the three research fellows from Burundi is supported by funding from the Africa Biosciences Challenge Fund (ABCF) fellowship program. Read more about the Africa Biosciences Challenge Fund here. The International Foundation for Science (IFS) announces a call for Collaborative Research Proposals from early-career scientists in Benin, Burkina Faso, Cote D’Ivoire, Ghana, Nigeria, South Africa, Tanzania and Uganda, with a focus on research into biodiversity. Interested young researchers from the above countries are invited to express their interest to participate in the development of collaborative research proposals. As part of its capacity building program, the BecA-ILRI Hub will hold a training workshop Laboratory Management and Equipment Operations Training Workshop at the Nelson Mandela African Institution of Science and Technology (NM-AIST) in Arusha, Tanzania on the 16th- 20th June 2014. Be nationals of BecA countries are eligible (Burundi, Cameroon, Central Africa Republic, Congo Brazzaville, Democratic Republic of the Congo, Equatorial Guinea, Eritrea, Ethiopia, Gabon, Kenya, Madagascar, Rwanda, São Tomé and Príncipe, Somalia, South Sudan, Sudan, Tanzania, Uganda). Strong affiliation with a national agricultural research program or institution or university in any of the above BecA countries. Currently engaged in agricultural biosciences research. Holders of BSc, MSc or PhD in biosciences or a related subject. The online application form must be submitted by mid-night, 17th April 2014 (Nairobi time). Successful applicants will be notified by 19th May 2014. The Swedish Ministry for Foreign Affairs through the Swedish International Development Cooperation Agency. The 40 Chances Fellows program will fund four 40 Chances Fellows with the most innovative social enterprise plans that use strategies built on the principles of 40 Chances: Finding Hope in a Hungry World. These social enterprises must seek to address issues of hunger, conflict, or poverty and may be established in any one of the following four countries where the Africa Governance Initiative has a strong presence: Rwanda, Liberia, Sierra Leone, or Malawi. Each of four fellows will receive $80,000 in start-up funds and $70,000 for living and transportation expenses (a total of $150,000) for one year. Application deadline is May 31, 2014 and winners will be selected by a blue ribbon panel of judges and formally announced at the 2014 World Food Prize Borlaug Dialogue in Des Moines, Iowa. Applicants must be between the ages of 18 and 39 on the date the application closes (May 31, 2014). During the 5-6 February 2014 Annual Conference organized by the Norwegian Institute for Agricultural and Environmental Research, Bioforsk, Dr Appolinaire Djikeng, Director of the BecA-ILRI Hub gave a keynote presentation on the opportunities and challenges of food security in Africa. 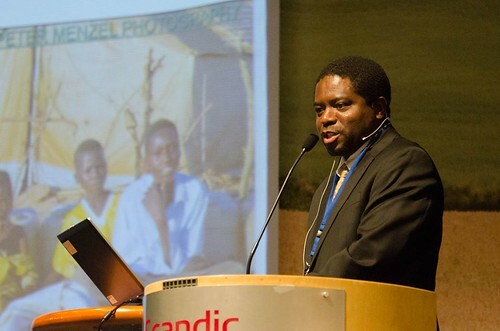 While at the conference in Hamar, Norway, Dr Djikeng also had the opportunity to compare the challenges that Sub Saharan Africa and South East Asia face in as far as food security is concerned with Dr Udaya Sekhar Nagothu, Director of International Projects in South and SE Asia and Africa at Bioforsk. In this 5minute film, Dr Djikeng and Dr Nagothu discuss the need to support small holder farmers in both regions to manage land and water resources, access markets and manage post-harvest losses to ensure sustainable food production. Bioforsk, the Norwegian Institute for Agricultural and Environmental Research, conducts applied and specifically targeted research linked to multifunctional agriculture and rural development, plant sciences, environmental protection and natural resource management. International collaboration is given high priority. Biosciences tools can be used to address many of Africa’s agricultural challenges such as pests, diseases and climatic constraints that result in low crop yields and poor animal productivity. However, opportunities linking modern biosciences to agricultural improvement to solve some of Africa’s major agricultural problems remain largely untapped. The BecA-ILRI Hub hosts and conducts research in crop, microbe and livestock areas where new developments in biosciences and well trained researchers can solve some intractable problems constraining Africa’s food security. For more information about the BecA-ILRI Hub please visit http://hub.africabiosciences.org/. As part of its capacity building program, the BecA-ILRI Hub will hold a training workshop on introductory molecular biology and bioinformatics from 5th to 16th May, 2014. For more information on the workshop, the concept note and draft program are available below. Selected applicants will be sponsored to attend an intensive 2-week training workshop consisting of lectures and hands on training in DNA purification, polymerase chain reaction (PCR), DNA sequencing and bioinformatics. Participants will also experience the research discovery process whereby potentially novel DNA sequences acquired by each participant will be analyzed and discussed during the bioinformatics sessions. Training will be given by experts in molecular biology and bioinformatics from the BecA-ILRI Hub and regional partner research institutions. Only nationals of BecA countries are eligible (Burundi, Cameroon, Central Africa Republic, Congo Brazzaville, Democratic Republic of the Congo, Equatorial Guinea, Eritrea, Ethiopia, Gabon, Kenya, Madagascar, Rwanda, São Tomé and Príncipe, Somalia, South Sudan, Sudan, Tanzania, Uganda). Letter of nomination/recommendation from head of department or institution head. The online application form must be submitted by mid-night, 28th February 2014 (Nairobi time). Successful applicants will be notified by 17th March 2014. Further information to successful applicants will be communicated by 24th March 2014. 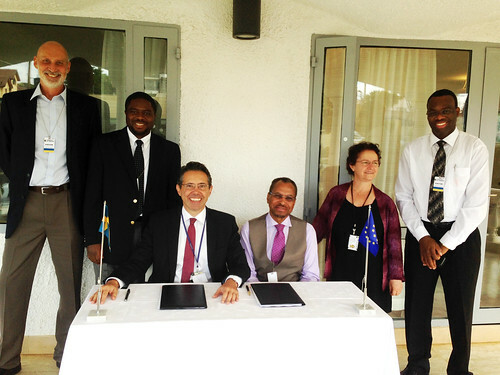 From 20 - 21 January 2014, members of the BecA-ILRI Hub team will be refining a strategy to deploy SEK 40 million (approximately USD 6 million) received from the Swedish government, late November 2013. The team is looking critically at how best the supplemental funding can be used to enhance research and capacity building activities in the BecA-Sweden partnership on food security and climate change. The funding agreement was signed at the Swedish Embassy in Nairobi on 22 November 2013 by Swedish Ambassador to Kenya, HE Johan Borgstam and ILRI Director General, Jimmy Smith following a review of the BecA-Sweden partnership projects. 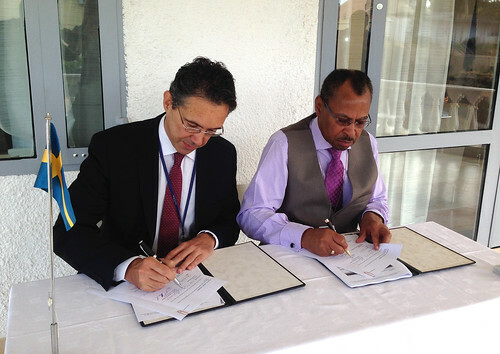 “The signing of this agreement is a testimony to the commitment the team has collectively demonstrated to deliver on existing agreements,” said BecA-ILRI Hub Director, Appolinaire Djikeng. “We are also very encouraged with the broader ‘south-south-north’ institutional cooperation that the Hub is now fostering. These are the partnerships 21st Century research needs in order to find solutions to food insecurity”, she said. The supplemental funding will also support the strengthening of shared technology platforms (genomics, bioinformatics, nutrition analysis and diagnostics) established by the Hub and will contribute to the development of research capacity in selected regional National Agricultural Research institutions. Other special opportunities exist to connect with CGIAR Research Programs on Livestock & Fish and Agriculture for Nutrition & Health to explore how their proposed research might fit into the on-going efforts to improve pro-poor food systems in Tanzania (smallholder dairy), Uganda (smallholder pigs), Egypt (aquaculture) and Ethiopia (small ruminants). Such collaboration would allow the candidate’s research to contribute more directly to an impact-oriented research-for-development agenda, and offer additional opportunities for joint activities. For more information, please contact: Dr. Amos Omorea.omore at cgiar dot org (Tanzania dairy); Dr. Danilo Pezo d.pezo at cgiar dot org (Uganda pigs); Dr. Malcolm Dickson m.dickson at cgiar dot org (Egypt aquaculture); Dr. Barbara Rischkowsky b.rischkowsky at cgiar dot org (Ethiopia small ruminants). We will begin to notify early applicants from Dec 1st 2013. The notification process will be completed by April 30th 2014. The Technical Centre for Agricultural and Rural Cooperation (CTA) is calling for proposals on innovations in use or have potential in smallholder agricultural production systems in ACP countries and which if known and widely promoted can benefit other farming communities. The BecA-ILRI Hub annual Scientific Research Paper Writing workshop kicked off on 18 November 2013 at the Nelson Mandela African Institution of Science and Technology (NM-AIST) in Arusha. During the official opening of the workshop, NM-AIST Deputy Vice Chancellor Academic Research and Innovation Professor Madundo Mtambo praised the partnership between the BecA-ILRI Hub and NM-AIST in strengthening the capacity of African scientists to drive Africa’s development. The writing workshop which is designed to boost publication by African scientists in international peer-reviewed journals has 25 participants from 13 BecA countries (Burundi, Cameroon, DRC, Eritrea, Ethiopia, Kenya, Madagascar, Rwanda, Somalia, South Sudan, Sudan, Tanzania and Uganda). The participants will undergo a 5-day intensive, interactive hands-on training, during which they will develop manuscripts from their own project reports, and/data. The goal is to have these scientists submit their paper to a journal for publication within three to six months of completing the workshop. The hosting of BecA-ILRI Hub’s writing workshop by NM-AIST is one example of the collaboration between the two institutions, who signed a formal letter of agreement for a Joint Capacity Development, Technology and Knowledge transfer Initiative on March, 14, 2013. Members of the CGIAR Fund Council had an opportunity to see firsthand how high end biosciences are enhancing agricultural research for development in Africa. 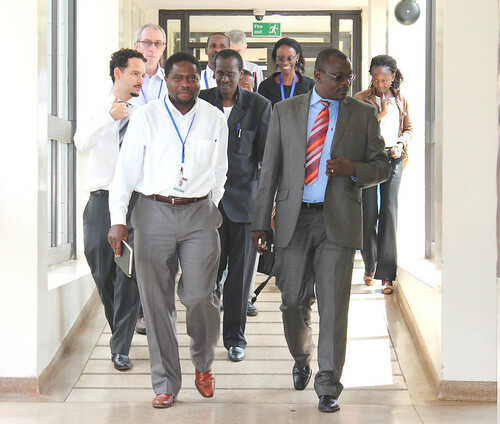 As part of their visit to the ILRI Campus in Nairobi on November 8 2013, the Fund Council members were led on a tour of the BecA-ILRI Hub by Director, Appolinaire Djikeng. 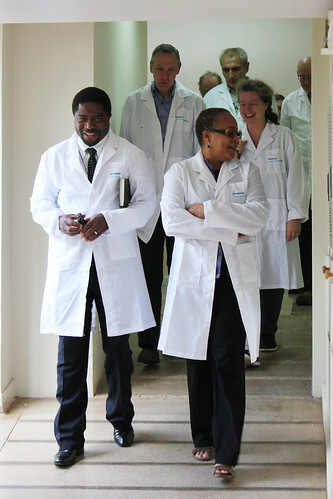 The BecA-ILRI Hub facilities have been made available to visiting scientists from different National Agricultural Research Systems (NARS) all over Africa through a strong capacity building program and through collaborative research projects. As they toured the facilities which include a range of advanced molecular biology, immunology, diagnostics, crop research laboratories, genomics and bioinformatics platforms, and a bio-repository, the Fund Council Members interacted with some of the visiting African scientists and learnt about the increased opportunities for CGIAR Research programs to complement Africa’s agriculture development plans and priority research initiatives. A better understanding of the quantitative, geographic, and time-based occurrence of aflatoxins in the food supply chain will boost the scale of response to this toxic threat to food safety globally. In a policy brief that highlights the need for accessible, affordable, and context-appropriate diagnostics tools, a team of researchers from the Capacity and Action for Aflatoxin Reduction in Eastern Africa (CAAREA) project that is working to develop such tools, discusses how these advances in technology will help policy makers to make informed interventions in improving food safety. The brief by CAAREA was among a set of 19 policy briefs that were launched by the International Food Policy Research Institute (IFPRI) on 5th November, 2013 in Washington DC. The policy briefs prepared by various groups of global experts review what is known about health risks from aflatoxins, discuss how to overcome market constraints to aflatoxin control, explore the international policy context for taking action in developing countries, and assess the state of research on new aflatoxin control technologies. Aflatoxins, toxic chemicals that are a by-product of fungus common in grains and other food crops, are a significant threat to food safety and security in many developing countries. These chemicals can cause cancer, are lethal in high doses, and may suppress immune systems, reduce nutrient absorption, and stunt the development of infants. A multi-disciplinary, five country team is working at the BecA-ILR Hub in an Australian Government funded research and development project, to develop cost effective tools that detect aflatoxin contamination in maize. The tools include real-time predictive tools to forecast potential aflatoxin outbreaks in maize that will ultimately help policy makers to target solutions before critical outbreaks occur. The International Foundation for Science (IFS) in collaboration with Bioversity International; Regional Universities Forum for Capacity Building in Agriculture (RUFORUM); and Institut de Recherché et de Développment sur la Biodiversité des Plantes Cultivées, Aromatiques et Médicinales (IRDCAM) would like to announce a call for the following workshop to be held in Bénin: "Scientific Writing and Communication with a focus on neglected and underutilised species of plants" being held on November 25-29th, 2013. Download details of the workshop, requirements and eligibility here. Download the appplication form here. Please note that the deadline for submissions of interest is 28th October, 2013. Please note that only nationals of Ghana, Senegal, Mali, Nigeria and Bénin are eligible.